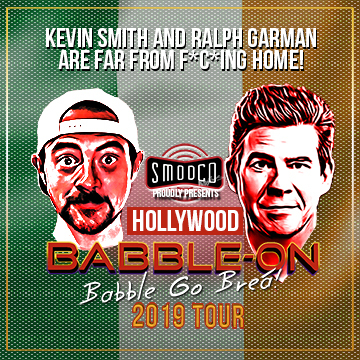 US writer, director, actor and podcaster Kevin Smith, alongside fellow actor Ralph Garman, are heading back to Vicar Street this May 9th with their legendary weekly podcast Hollywood Babble-On. Recorded live in front of a theatre audience, these shows will see Smith and Garman look back at the week’s biggest entertainment stories from the US and beyond. The duo brings current Hollywood events to life by entertaining audiences with their unique brand of comedy, infamous impressions and vivid improvisation. Movies, TV, music, the internet - no medium is safe when these podcasting pundits use their mouths on 'em! Tickets for ‘Babble Go Breá!’ are on general sale from Thursday 7th February at 10am from www.ticketmaster.ie & usual outlets nationwide. Hollywood Babble-On quickly became a podcast sensation with a mammoth following. It has been named by iTunes as one of the ‘Best Podcasts of The Year’ and regularly appears as one of the Top 20 rated podcasts. The podcast frequently tours cities around the United States and Canada recording episodes in front of sold-out audiences including special episodes from iconic events such as Comic-Con in San Diego. It was recently announced that after nearly 20 years Kevin Smith and his Jay and Silent Bob co-star Jason Mewes will be returning with the sequel to 2001 cult film Jay and Silent Bob Strike Back. Filming on the new film is due to begin in spring 2019. Tickets €42 on sale now through www.ticketmaster.ie & usual outlets nationwide.